The Rev. 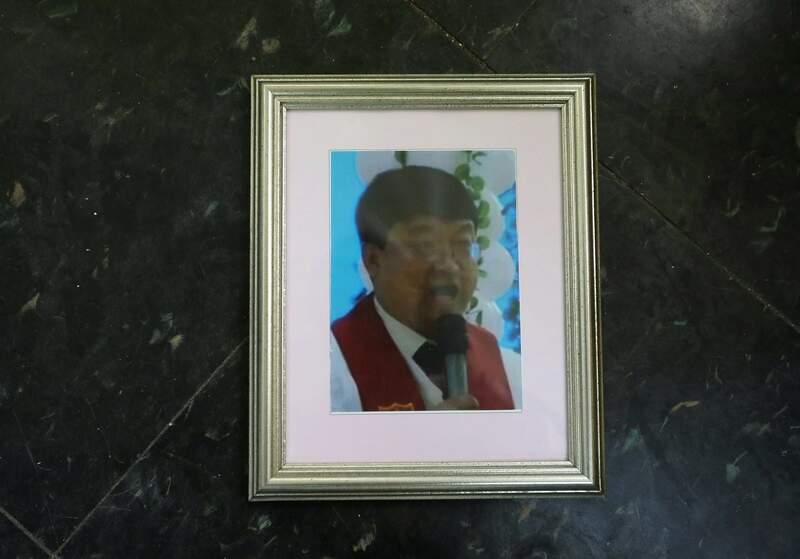 Kim Kyou Ho, head of the Seoul-based Chosen People Network, a Christian group that runs a memorial hall in the South Korean capital for the victims, shows a portrait of the Rev. Han Chung-ryeol, right, a Chinese pastor of Korean descent who headed a front-line church in the Chinese border town of Changbai before he was found dead of multiple stab wounds and a punctured skull in April 2016, at his office in Seoul, South Korea. Missionaries in northeastern China are engaged in a dangerous work: spreading Christianity across the border to North Korea. A South Korean pastor says at least 10 such front-line missionaries and pastors have died mysteriously in recent years. SOUTHERN JILIN PROVINCE, China – To the North Koreans gathered beneath a crucifix in an apartment in this northeastern Chinese border region, she is known as “mom.” She feeds them, gives them a place to stay and, on occasion, money. In return, the 69-year-old Korean-Chinese woman asks them to study the Bible, pray and sing hymns. She also has a more ambitious, and potentially dangerous, goal: She wants the most trusted of her converts to return to North Korea and spread Christianity there. Along the North Korean border, dozens of such missionaries are engaged in work that puts them and their North Korean converts in danger. Most are South Koreans, but others, like the woman, are ethnic Koreans whose families have lived in China for generations. In recent years, 10 such front-line missionaries and pastors have died mysteriously, according to the Rev. 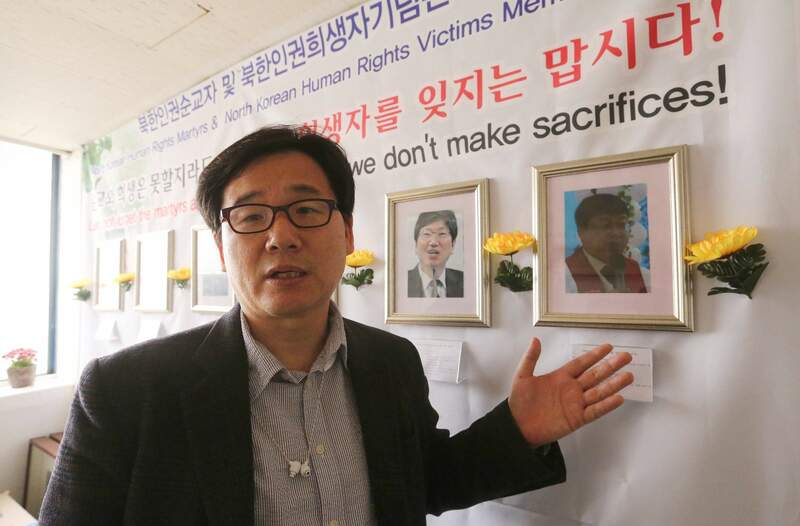 Kim Kyou Ho, head of the Seoul-based Chosen People Network, a Christian group that runs a memorial hall in the South Korean capital for the victims. North Korea is suspected in all those deaths. A portrait of the Rev. Han Chung-ryeol, a Chinese pastor of Korean descent who headed a front-line church in the Chinese border town of Changbai before he was found dead of multiple stab wounds and a punctured skull in April 2016, at the Seoul-based Chosen People Network office in Seoul, South Korea. Missionaries in northeastern China are engaged in a dangerous work: spreading Christianity across the border to North Korea. A South Korean pastor says at least 10 such front-line missionaries and pastors have died mysteriously in recent years. Hundreds of other missionaries have been imprisoned or expelled by China, which bans foreigners from proselytizing. It is perilous work. Li Baiguang, a Chinese human rights lawyer whose work defending Christian pastors and farmers had prompted repeated death threats, died on Feb. 26, hours after being admitted to a Chinese military hospital for what his relatives described as a minor stomach ailment. The case has prompted calls for an independent investigation from Amnesty International and the Washington-based National Endowment for Democracy, which noted Li had been “detained and physically attacked many times” for his work and cited reports he had recently appeared to be in good health. The Korean-Chinese woman said she is monitored by both North Korean and Chinese authorities, yet, despite the risks, has carried out 20 years of missionary work with North Koreans, mostly women who are in China legally after being granted visas to visit relatives living there. “I always pray and I’m with God, so I’m not worried,” said the woman, who despite that assertion asked that her name not be published because of safety concerns for herself, her family and the North Koreans to whom she ministers. A man walks past a church at a border town in northeastern China’s Jilin province. Missionaries in northeastern China are engaged in a dangerous work: spreading Christianity across the border to North Korea. A South Korean pastor says at least 10 such front-line missionaries and pastors have died mysteriously in recent years. She lives so close to North Korea that it is common to see women doing laundry on the other side of the Yalu River or workers riding bicycles past rundown North Korean buildings just a stone’s throw away. The border missionaries provide their North Korean visitors with room and board, and those escaping with places to hide. In return, they ask them to memorize the Lord’s Prayer, the Apostles’ Creed and other prayers. Some of the most trusted converts return home to North Korea and covertly share what they’ve learned, sometimes carrying Bibles. It’s almost impossible to determine what happens when those North Koreans return home to evangelize. From the outside, there is no indication that Christianity has grown in any serious manner in the North in recent years, let alone that it’s helping shake North Korean leader Kim Jong Un’s power. 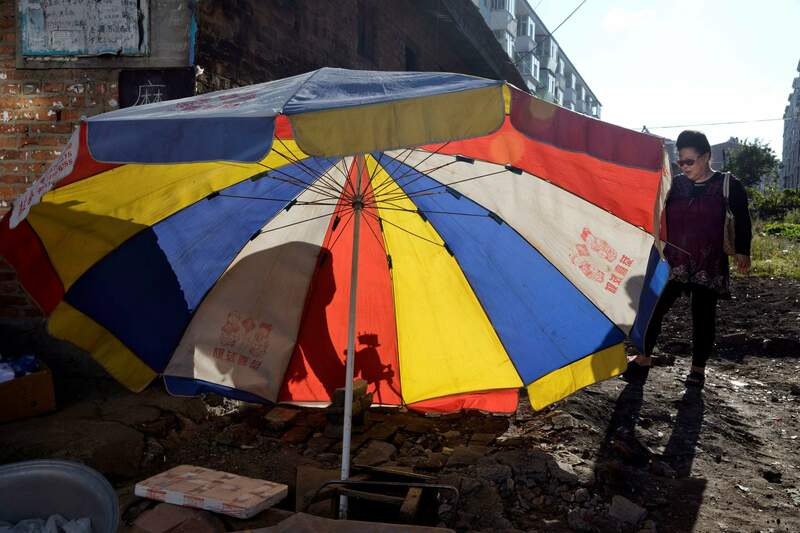 A pop corn vendor works behind a multi-color umbrella near the site of a church in the Chinese border town of Changbai in northeastern China’s Jilin province. Missionaries in northeastern China are engaged in a dangerous work: spreading Christianity across the border to North Korea. A South Korean pastor says at least 10 such front-line missionaries and pastors have died mysteriously in recent years. The North accuses South Korea’s spy agency of using missionaries to gather information about North Korea’s secretive nuclear program and other sensitive topics, as well as to smuggle propaganda materials via leaflets, CDs and USB sticks, and to build underground churches to undermine Kim’s leadership – allegations the Seoul government strongly denies. At least two South Korean pastors are detained in the North on such charges. Officially, North Korea says it guarantees freedom of religion to its 24 million people. But in reality, people involved in Bible distribution, secret prayer services and underground church networks are imprisoned or executed, according to activists and defectors. The North has five government-sanctioned churches in Pyongyang, but critics say they are showpiece facilities opened only for foreign visitors. Among the missionaries and pastors killed under mysterious circumstances in recent years is the Rev. Han Chung-ryeol, a Chinese pastor of Korean descent who headed a front-line church in the Chinese border town of Changbai before he was found dead of multiple stab wounds and a punctured skull in April 2016, raising suspicions that North Korea was involved. 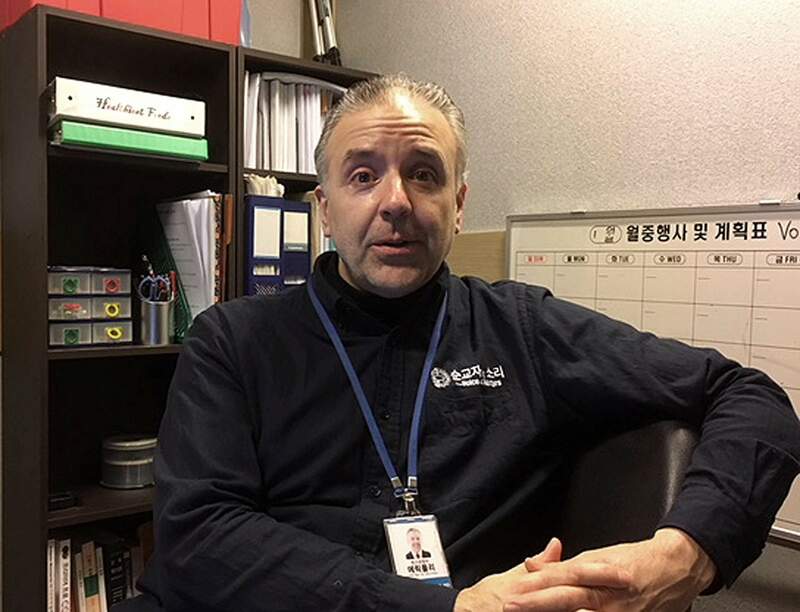 Eric Foley, the American co-founder of Voice of the Martyrs Korea, speaks during an interview at his office in Seoul, South Korea. Missionaries in northeastern China are engaged in a dangerous work: spreading Christianity across the border to North Korea. A South Korean pastor says at least 10 such front-line missionaries and pastors have died mysteriously in recent years. Chinese police recently told his family that surveillance video had captured images of three men and a woman suspected of being North Korean agents crossing the border before and after the 49-year-old pastor’s slaying, Han’s sister, Han Songshi, told The Associated Press. She said Chinese authorities told the family the North didn’t respond to Chinese requests to extradite the suspects. North Korea instead sent a letter to the state religious affairs bureau in Changbai saying it had arrested one of Han’s church deacons, Zhang Wenshi, and sentenced him to 15 years hard labor, according to two people with direct knowledge of the case who spoke on condition of anonymity, fearing retribution from North Korea and China. In a copy of the letter seen by the AP, North Korea accused Zhang of conspiring with Han in a plot to evangelize North Koreans, smuggle them out of the country and subvert the North’s government. But the letter stopped short of acknowledging that North Korean agents killed Han. A spokeswoman for the Changbai police department would not confirm the family’s account, saying only: “We have no obligation to release the details of the investigation to the media.” A state-run North Korean website denied any involvement in Han’s slaying, accusing South Korea’s then-conservative government of being behind a scheme to foster anti-Pyongyang sentiment. Though Han was little known to international media before his death, he was an important figure in the risky, covert work to promote Christianity in the North, which views such efforts as a Western-led plot to topple its government. At the Chinese government-registered church in Changbai where he had worked since the early 1990s, he fed and sheltered thousands of North Koreans over the years – many of whom had fled their famine-stricken country in search of food and jobs – while also converting hundreds of them to Christianity. 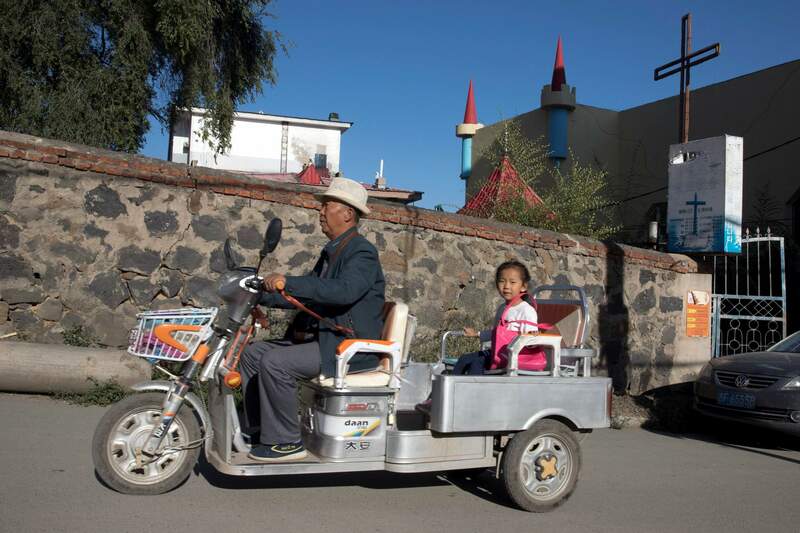 A man give a child a ride past a cross at what used to be the site of a church in the Chinese border town of Changbai in northeastern China’s Jilin province. Missionaries in northeastern China are engaged in a dangerous work: spreading Christianity across the border to North Korea. A South Korean pastor says at least 10 such front-line missionaries and pastors have died mysteriously in recent years. Eric Foley, the American co-founder of Voice of the Martyrs Korea, a Seoul-based Christian nonprofit group that provided funding, Bibles and other resources for Han’s work, said he believed the Chinese authorities looked the other way about Han’s proselytizing because they considered his charitable work to be a “social service” that helped allay potential problems like crime, unemployment and homelessness among the North Koreans in Changbai. “That allowed him to do that work in a level of volume that was unparalleled up and down the border,” Foley said. He insisted, however, that Han did not facilitate defections of North Koreans to South Korea, which is banned by China. However, seven other defectors and activists interviewed by the AP said Han did sometimes help North Korean defectors flee to South Korea, though he was reluctant to do so for fear of angering the Chinese authorities and imperiling the work of his church. Choi Sung-ryong, a Seoul-based activist, said he resettled 10 North Koreans in South Korea at the request of one of Han’s deacons. When one of his converts volunteered to return to North Korea to share the “love of God” with her countrymen in 2011, the woman said Han smiled at her, asked her to memorize as many Bible phrases as possible and gave her 5,000 yuan ($800) to buy a house in the North that she could use as a gathering place for underground Christians. “He told me that house would be a church or a place for God,” said the North Korean woman, who has since defected to South Korea and spoke on condition of anonymity because of concerns for the safety of her relatives in the North. As a result of his risky work, North Korean defectors, including the woman, had long warned Han that the Pyongyang authorities had him on the country’s most-wanted list. Han knew he was “at the top of a blacklist by the North’s Ministry of State Security,” the North Korean woman said. 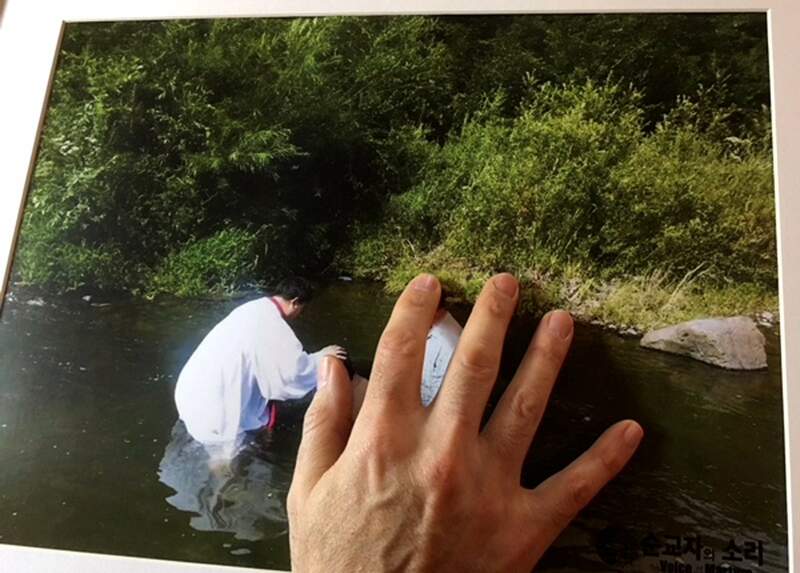 Eric Foley, the American co-founder of Voice of the Martyrs Korea unveils a photo showing Korean-Chinese pastor Han Chung-ryeol, left, a Chinese pastor of Korean descent who headed a front-line church in the Chinese border town of Changbai before he was found dead of multiple stab wounds and a punctured skull in April 2016, during an interview at his office in Seoul, South Korea. 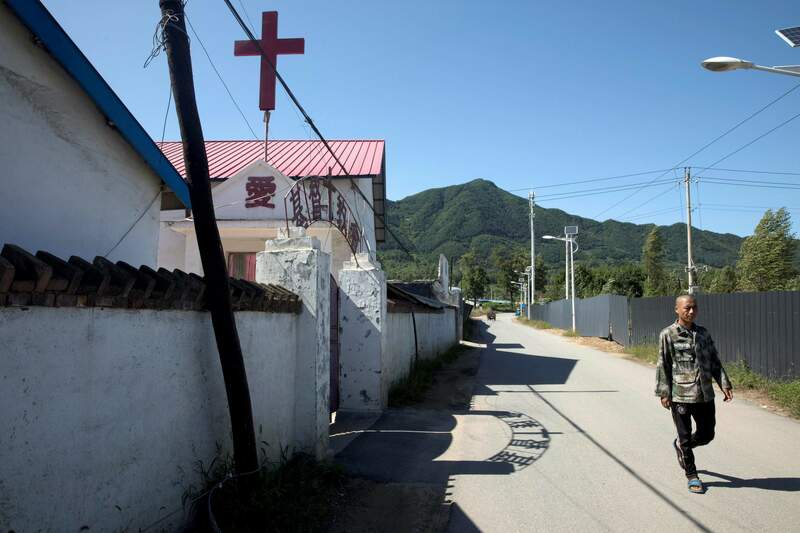 Missionaries in northeastern China are engaged in a dangerous work: spreading Christianity across the border to North Korea. A South Korean pastor says at least 10 such front-line missionaries and pastors have died mysteriously in recent years.